Fried Corn Recipe (Southern Fried Corn) – The best southern classic. Fresh corn on the cob is shucked, scraped and fried in a cast iron skillet with flavorful bacon drippings and sugar for the most delicious side to serve all summer. Get ready everyone, I’m about to share with you a recipe that’ll start up an addiction to corn you never knew you could have. I serve a lot of corn during the summer. I make this Shrimp and Corn Chowder. I love this Mexican grilled corn. I also love this southern succotash recipe. Corn season is among us! whether you’re having it at your dinner table or on your grill, it’s fresh summer flavor is undeniable. Sweet, salty and just a little crunch is all you need to brighten up anything you choose to serve it with. Fried Corn Origins – What’s Southern Fried Corn? For those of you who aren’t familiar with Southern Fried Corn, I’m not talking about a battered and deep fried whole ear of corn. We’re talking caramelized sweet kernels coated in a little sugar, butter and bacon. Each bite is a burst of flavor in your mouth! As far as texture, it may be similar to creamed corn but it doesn’t have cream in it. Every Big Mama, Nana and Mama has their own spin on Fried Corn, but no matter the tweak it remains a southern classic. This is my mama’s recipe. It is simple yet perfect. 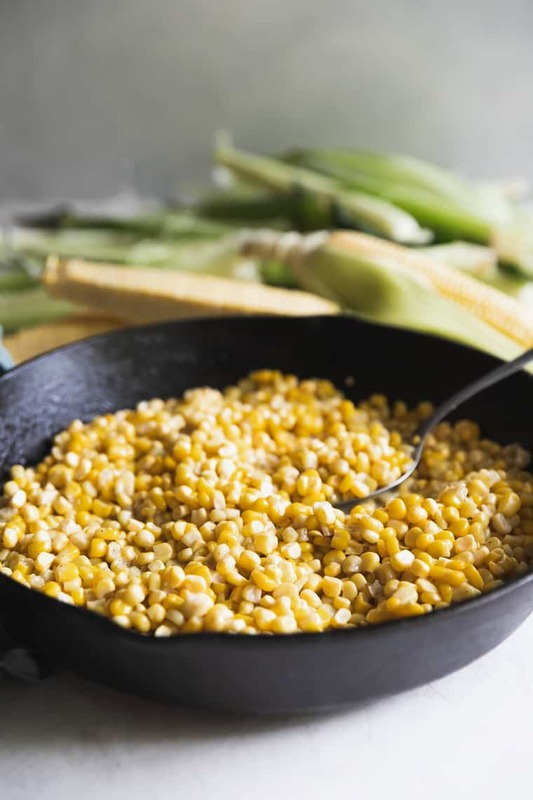 It lets the corn shine but adds some additional flavors to really amplify the taste. My mama has been making this recipe every summer for as long as I can remember. Fried corn was served at every barbecue we had, and I could not get enough of it. I still enjoy it today as much as I did the first time I had it. Though I have loved other’s variations, I come back to this recipe time and time again. Fried corn is simple to make but you must start with great corn. Make sure you check the kernels to insure they are a beautiful yellow and plump in texture. That always shows you its a good ear of corn. If you can’t check the kernels before grabbing it, look at the husk color. It should be bright green and fresh looking. That will also give you clues on the quality of the corn. This fried corn recipe doesn’t require too much time. The bulk of the time is spent scraping the corn off of the cob and corn shucking. For the scraping, my mama does it a specific way. She starts on one side of the cob and cuts about a third of the corn off making tiny kernels then she goes in again another third of the way and then finally does a last scrape all the way on the cob. Her method to the madness is she doesn’t like the kernels to be too large and she says it is juicier this way. You can totally do this or do it whatever way you like. If you like larger kernels, cut them that way. Totally up to you. 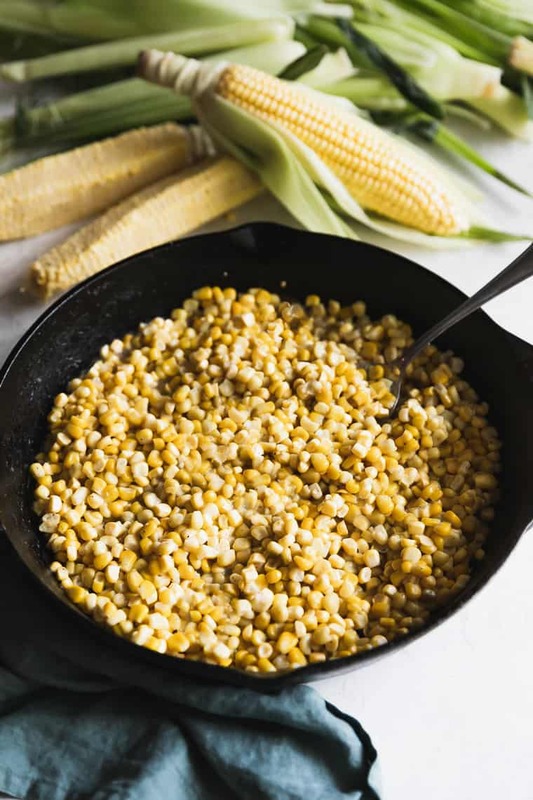 You can make this southern fried corn recipe in less than 30 minutes and in only one skillet. The flavors marry together quickly, making this a side dish that’ll wow anyone from dinner guests to little ones with picky palettes! My mama’s recipe is a sure fire way to introduce a new tasty southern staple to your summer night tables. This recipe is perfection with fresh corn but you can also use frozen corn if needed. So get out that cast iron skillet and let’s bring a little piece of the South to your kitchen tonight. Hey you can even throw some in my Mexican Cornbread recipe. Win! Win! 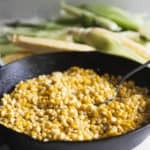 Fried Corn Recipe (Southern Fried Corn) - Fresh corn on the cob is shucked, scraped and fried in a cast iron skillet with flavorful bacon drippings and sugar for the most delicious side to serve all summer. 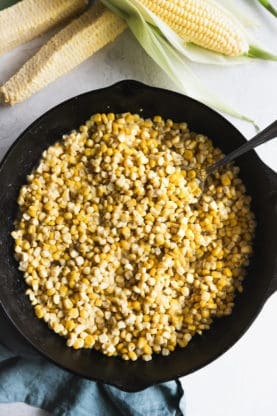 To begin, completely rinse and cut the kernels from the cobs of corn and add to a large bowl. Then add to water. Next stir flour, sugar, salt and pepper into corn and water mixture. Make sure it is completely smoothly dissolved into the water. To a cast iron skillet, add bacon drippings and butter and heat over medium high heat. Once the butter has completely melted (make sure it doesn’t burn), pour corn mixture into hot skillet and continuously stir. Turn the heat down to medium. Cook approximately 12-15 minutes and serve. I tried to sign up for the newsletter; I’m directed to an error message each time. I don’t know if it’s on my end or the site. I’d love to be subscribed, can you add me on your end? I’m so eager to learn about your family through your recipes! Hi Patty, I will add your email address to my subscriber list today. Can I make.it with canned.corn? And how do I adjust recipe for 2 cans? 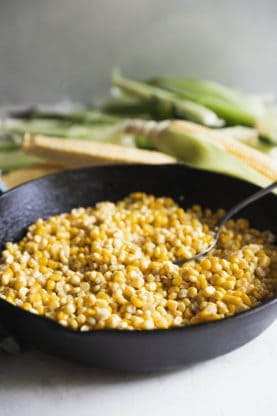 Hi Rebecca, I have never tried this recipe with canned corn since it is a family recipe but you can definitely give it a try. Not sure on how the amounts would change because I’m not sure of the amount of corn in each can. It would take a little experimentation. Frozen corn would be a better alternative. Yes you can use turkey bacon drippings or butter. I just want to say, be sure to use a 12-14″ skillet. I found the standard sized cast iron skillet too small. However, great recipe! Fantastic!!! I’m so glad you enjoyed it. This was too.die.for!!!!!!!!!!! Hands down the best recipe ever!!! I made it with fresh sweet corn from Nebraka, thanks to my daughter in law who brought it back from her parent’s garden! I did not add sugar as this corn tasted like it had been through Willey Wonka’s factory! Thank you for posting this recipe!!!!! This seems like a lot of water. Do you use all the water in the trying pan? Im confused. I’d like to give this a try! Sounds so easy! My version of this is almost the same except I don’t use flour or sugar in mine. I use beacon dripping or unsalted butter. I do use a cast iron skillet salt and pepper to taste. This is how my grandmother made it in Texas. Grew up on this stuff. Yum! Oh yes!!!!!! I love fried corn. So glad ours are similar! This looks like a great side dish for any gathering! What a great side dish! I can’t wait to try this and will be soon. I love this idea! Looks really good!! This is similar to the recipe that my mother passed down to me (we add chopped onion and green bell pepper). It is my favorite dish, and SO GOOD! So glad that you are sharing it with everyone! This corn looks so delicious! This looks absolutely amazing! I cannot wait to try it!